Skeeters are the ultimate wrap-around shooting glass. Featuring a yellow lens that eliminates glare, they increase contrast and provide clearer vision even on rainy days. 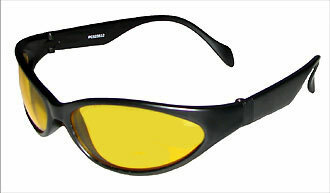 Lenses are Impact Resistant Polycarbonate that also provide UV-400 protection. A soft plastic frame flexes to comfortably fit your face, while the rubber ear grips keep 'em securely on your head and out of the bushes ;) Skeeters fit best on people with medium to X-large faces. Also excellent for night riding or driving!